High protein weight gain powder. The True Strength of Weight Gainers. Serious weight gain requires serious calories. However, those who need the extra calories most, often have the toughest time consuming enough of them. High protein weight gain powder. The True Strength of Weight Gainers. Serious weight gain requires serious calories. However, those who need the extra calories most, often have the toughest time consuming enough of them. For many aspiring to be bigger, highly-active metabolisms, weaker appetites, and on-the-run lifestyles make consuming sufficient calories through whole foods alone a real challenge. With Serious mass, you’ve got nothing to lose and lots to gain. We’ve consolidated over 1,250 calories, 50 grams of protein, 250-plus grams of carbohydrates, and 25 vitamins and minerals with added glutamine and creatine into every serving. It’s time to stop thinking small; get serious – Serious Mass. Add two heaping scoops of Serious Mass to a blender filled with 24 oz of water. Blend for 45-60 seconds. Then add a few ice cubes and, if desired, other calorie-contributing ingredients (see “Supercharge Your Serious Mass” on the opposite panel) and blend for an addition 30-45 seconds. TIPS: Mixing two scoops of Serious Mass with 24 fl oz of nonfat or low fat milk instead of water will give you a thicker, creamier, higher-calorie shake. New users may find it beneficial to begin with 1/2 serving daily for the first weekend then gradually increase to 1 or more full servings several times a day. Serious Mass is a substantial weight-gain supplement that can be used to feed serious calorie needs in a variety of different ways. BETWEEN MEALS: Drink 1/ 21serving of Serious Mass between meals to maintain positive nitrogen balance and support a high-calorie diet. POST-WORKOUT: Begin drinking 1/ 2-1 serving of Serious Mass 30-45 minutes following exercise to support maximum recovery. BEFORE BED: Drink 1/ 2-1 serving of Serious Mass about 45-60 minutes before bed to provide nutrients to recovering muscle throughout the night. NOTE: For best results use Serious Mass combined with intense weight training (3-5 times per week) and a sensible whole foods diet. Also, keep in mind that sufficient recovery between workouts impacts your ability to gain lean mass. Allowing at least 48 hours between workouts involving the same body parts is recommended. WARNING: Consult your physician before using this product if you are taking any medications or are under a physician’s care for a medical condition. Not for use by those under the age of 18 or women that are pregnant, trying to get pregnant, or nursing. 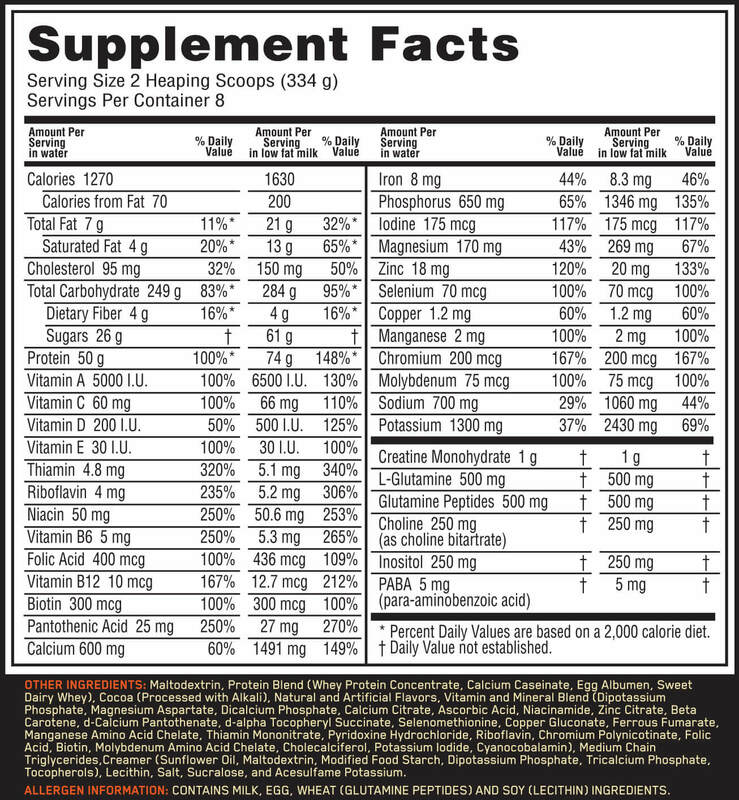 ALLERGEN INFORMATION: Contains milk, egg, wheat (glutamine peptides) and soy (lecithin) ingredients.